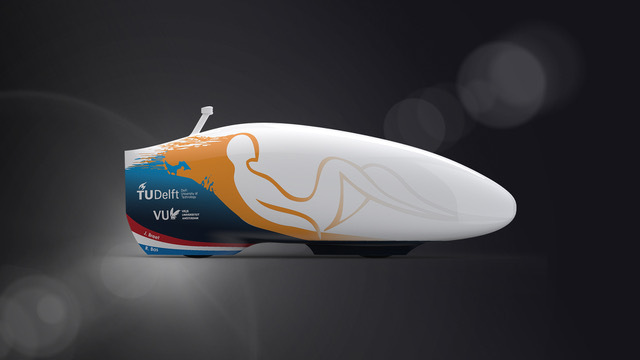 The Human Power Team, a student project from the Delft University of Technology and Vrije Universiteit Amsterdam, has today presented their new design of their newest aerodynamic recumbent bicycle: the VeloX 9. With this bicycle they will attack the world speed record of 121.8 km/h this September in Nevada. Besides that, the VeloX is made of super lightweight materials and on top of that made as small as possible to limit the air resistance. To save space, a custom gear shift system is developed where the cassette moves instead of the drive chain. Furthermore, the VeloX will ride this year using special developed tires leading to the lowest rolling resistance. The VeloX is specifically designed for the two female athletes: Jennifer Breet and Rosa Bas. Jennifer was also part of the team previous year where she won second place during the WHPSC. With her experience and enthusiasm she will try to reach the ultimate goal: a world record. Rosa has been rowing on a high level until recent summer and even rowed at the World Championship. She will as well aim for a world record during the race. The Human Power Team is a student team that since 2010 strives to push the limits of human and technical potential. This is achieved by building an extremely aerodynamic recumbent bike and training two athletes. The team consists of 16 students from the Delft University of Technology and the Vrije Universiteit Amsterdam who take a gap year to reach their ultimate goal: set a world record.